Washing agent and polish for latex clothing. 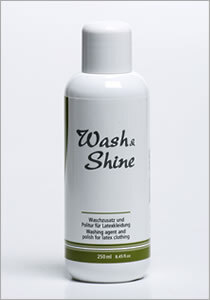 Protects and gives a perfect shine. After washing your latex clothes in soap and clean water, add 2 or more squirts of our washing agent and pull the clothes through the water. Then let it dry.